Halloween could still be a healthy day!! It is a matter of how you set yourself up. Hopefully you will dress up and have a fun-filled day. But, that day does not have to include eating, or even gorging, on candy. It is in how you mentally set yourself up for this day. Today make this a healthy Halloween and maybe even the first of a new tradition. Skip the candy completely. Just because you have always had candy on Halloween doesn’t mean it always Has to be that way. Interject with thoughts about what you really want for yourself. Thoughts about how you really want to be healthy and that this could be that first day of a better way of life. Then follow-up on those thoughts by acting accordingly. You can skip the candy. You will actually feel better without it. This is written with adults in mind. As for kids, they should be able to enjoy Halloween much like we did, with the candy. Then even with your kids, it is a matter of how you set it up for them. 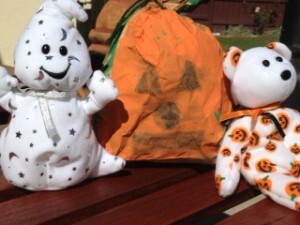 Halloween is a day that we can teach kids how to enjoy a celebratory day with balance. Gorging on candy until they feel sick is not teaching balance. Halloween is a great day to let them eat some candy and enjoy a day that is fun because they dressed up in a costume and were given lots of candy. That is a super fun day!! As parents we get to revel in their fun and also teach a little. It’s very easy, just let your kids know that they can eat 3-5 pieces of candy. The best thing you can do as a parent is to tell them why. Tell them that you love them and care about them, and because their health is so important to you, this matters. Not eating lots of candy does make a difference to their health. There is the healthy message for your kids and for their future Halloweens. This sets them up so that they won’t have to battle years of Halloween gorging and a need to set up new habits around a holiday. Yummy!!! 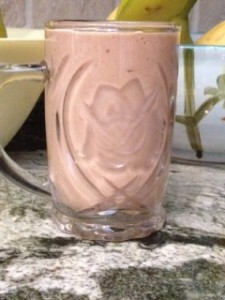 The perfect way to pick up my boys from school with a Dairy-Free Banana Date smoothie. It tastes as good as it looks! It is so creamy and yummy! It actually tastes like it has ice cream in it. Which of course it does not! We are a dairy-free family!! I have been making them healthy kid friendly smoothies for years. Majid and I have been dairy-free since 1993. A long time ago when there weren’t as many dairy-free options available.This means I have decades of creating great meals and smoothies without any dairy products at all. My Full Body 30 Day Vegan Cleanse has this recipe in it. And many more healthy kid friendly smoothies that you can make for your family to keep them healthy! Your kids will love them just as much as my kids have! And the best part is, it is only made from ingredients that will benefit their body’s. No ingredients that are harmful in any way for them. Which is Very different from the majority of smoothies made for kids. The majority of smoothies that are made for kids have way too much sugar in them, and some places use frozen yogurt making their smoothies even higher in sugar. These smoothies are not healthy for kids once you realize they can have more sugar than candy bars! Horrifying fact! It is a priority to me to feed my boys in the healthiest way possible. I have been in the Wholistic Health field since 1993 as a licensed Herbalist/Acupuncturist and with decades of experience I fully understand the dynamic relationship between the human Microbiome and the gut. Which is why I chose to make healthy kid friendly smoothies for my boys that will give their body’s nutrients and phytochemicals their body’s needed. healthy kid friendly smoothies- Delicious! Dairy-free. Heart healthy! Absolutely! Lentils provide a whopping dose of soluble fiber. This is great for your heart as it helps to keep cholesterol low. Another heart health contributor is the fact that lentils have been found to reduce homocysteine levels. Homocysteine is a bio-chemical which is produced by the body that is in stress. It is always found in people who have had a heart attack and is used as a marker in blood tests as an indicator for predicting heart attacks. It is very nice to know what foods can help reduce this marker. Lentils are also great for your digestive tract. All the soluble fiber stimulates the peristalsis in the large intestines and helps to move waste along and then out. Good digestive health can be accomplished by increasing foods with high fiber content in your diet. Many of the digestive problems seen in Americans have everything to do with the fact that the majority of Americans are not eating as many fiber rich foods as their bodies really need. 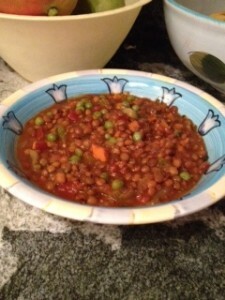 Lentils can also be a big help in loosing weight. Lentils are not high in calories but because of their high fiber content, they can make you feel full enough that you are satisfied. That being the case, you won’;t eat anything else and therefore your dinner was a low-calorie healthy and satisfying meal. Insurance is such a hot topic, understandably with so many really big and important changes that will effect all of us here in America. Insurance companies have had to pay out a lot more money in the last 2 decades than ever before. Parallel to the billions that has been paid out is the still increasing bad health many Americans have gotten into. And, Americans are paying billions in medical bills concurrent with the biggest health crisis the world has ever seen. Read on to discover how to lower health insurance premiums. The Standard American Diet, (SAD), is the reason for the health crisis. Full Body 30 Day Vegan Cleanse is thee answer to help teach you how to be healthy. It is all laid out. The book is 30 days of what to eat for breakfast, lunch dinner, snacks, smoothies, vegetable juices and protein shakes. It leads you through day-by-day it’s so easy because all you have to do is follow it. Every breakfast is listed with the recipe. Then every lunch also. And, every dinner is also given with the recipe. You don’t have to even think about what to eat. Most importantly, this Cleanse teaches you how you can eat healthfully for the rest of your life. This is how to lower your health insurance premiums. Once your health insurance company sees consistent healthy ranges on lab-work, they might lower your premiums. Many of the people who have already done the Cleanse, have done it a third time even. Everyone truly enjoyed feeling so great. Loosing weight./ Having more energy. Having better mental clarity. You can visit the website fullbodyvegancleanse.com and watch video testimony from some people who have already taken this Cleanse. Full Body 30 Day Vegan Cleanse reversed intestinal polyps for someone who had had polyps for a longtime. How Did You Tend Your “Garden” Today? It’s another beautiful day!! It’s another opportunity to take care of yourself and your family. Many people do take great care of their literal gardens, outside of their home…but what about you? Your “Garden”? It is great to consciously take steps each day that will take care of you. Your health, your body and yes, then even your spirit. “Did you tend your garden?” is such a wonderful phrase. I of course always apply it to the most personal aspect I can get. I apply it to my body. “How did I tend my garden today?” The next natural extension is then to my family. I want to have those answers readily available everyday about how I took care of them. It’s a gentle way of asking yourself and reminding yourself to take steps every day to take care of yourself.Our bodies are thee most amazing creation. And this was given to you. Instead of treating it like it is something of no value, just because it was given to you, treat it with the utmost respect and value it for all it is. It is your body you are reading this with. it is your body that turned to its side and got you out of that bed this morning. It is your body that allows you to feel all those wonderful feelings you have for the people you love.